Thankful. That’s what Mike Morrell feels when he reflects on his emergency experience with OSF HealthCare. It was just two days after Mike had retired as a pastor from Mendota First United Methodist Church that he woke up in the middle of the night with what felt like heart burn. After realizing over-the-counter medication wasn’t going to help with the pain, he knew he needed medical assistance. When the paramedics arrived, they were able to get Mike stabilized and transported to the Emergency Department at OSF HealthCare Saint Paul Medical Center. 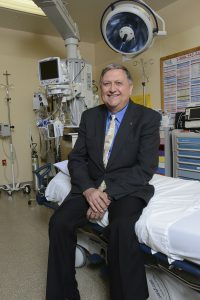 The medical staff performed a series of tests before determining that the advanced cardiology care Mike required would be best suited for OSF HealthCare Saint Anthony Medical Center, a 50 top heart hospital in the U.S. While in transit, the Rockford cardiology staff was already assessing Mike’s medical records and determining his course of treatment – all before he even set foot in the door. Upon arrival, Mike was put in the Intensive Care Unit at OSF HealthCare Saint Anthony. After another round of tests, the medical team concluded that Mike needed a stent put into the artery leading to the back of his heart. It was determined that he had some plaque buildup that had ruptured his artery and caused lack of blood flow to his heart. Mike underwent surgery and was able to return home the next day. He recalls his care team explaining that not all patients are as fortunate. Most cases like his result in cardiac arrest. “The fact that I didn’t actually have a heart attack most likely was the result of the timely care I received from the paramedics, the Emergency Department at OSF HealthCare Saint Paul and OSF LifeFlight,” Mike said. A few days after Mike’s surgery, he went back to the paramedics and the Emergency Department at OSF HealthCare Saint Paul to thank them for helping to save his life. “I’ve always had a great experience at OSF Saint Paul the few times I’ve been there as a patient and the many times I’ve been there as a pastor ministering to patients there,” Mike said.